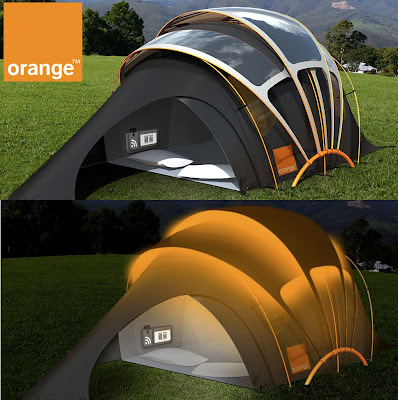 Orange has revealed their vision for the tent of the future. 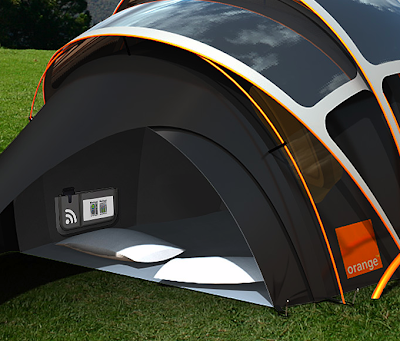 Utilising cutting edge eco-energy technology, the Orange Solar Concept Tent will allow campers to keep in touch and power their essential camping gadgets. The Concept Tent has been designed in association with American product design consultancy Kaleidoscope and builds on learnings from the original Orange Solar Tent that was trialled at Glastonbury in 2003, as well as 2004’s Orange Text Me Home Dome. Having worked closely with Glastonbury for the last eleven years, Orange know the importance of keeping in contact with friends while on site and undertook this concept project to look at how the festival goers communication and power supply needs might be met in the future. Latest research shows that by weaving specially coated solar threads into conventional fabric, revolutionary new ways of capturing the sun’s energy could soon become a reality. 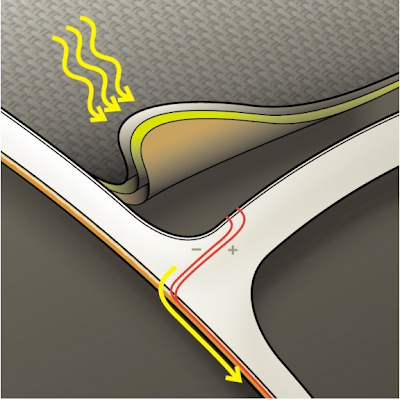 These radical advances mean that rather than relying upon familiar fixed panels, designers were free to conceive how a tent of flexible solar fabrics might look. 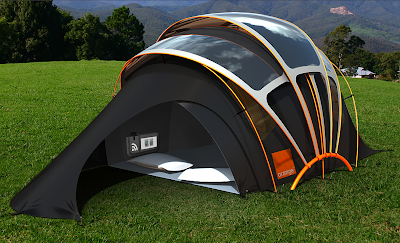 The Concept Tent’s solar shell uses this technology to full effect with three directional glides which can be moved throughout the day to maximise its solar efficiency, capturing the optimum amount of energy which can to be used throughout the tent in a variety of new and exciting ways. 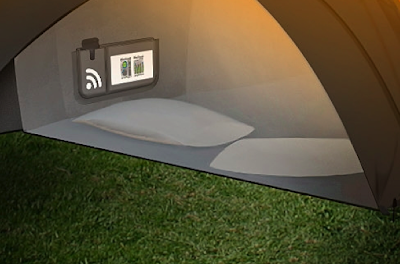 To avoid festival-goers ever losing their tent, the Concept Tent would be fitted with innovative “glo-cation” technology. 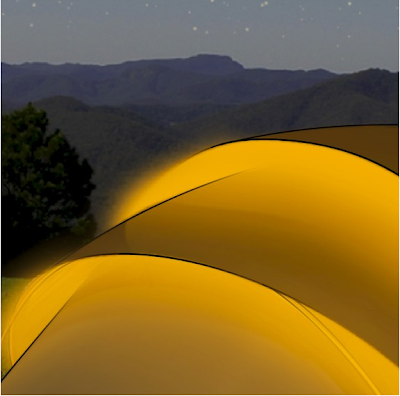 Glo-cation works by enabling campers’ mobile phones to identify their tent using either an SMS message or automatic active RFID technology (a longer range version of that used in London Underground Oyster cards); both would trigger a distinctive glow in the tent helping identify it from a distance. The heart of the Concept Tent is a central wireless control hub which displays energy generated and consumed as well as providing a wireless internet signal; all information is displayed on a flexible, touchscreen LCD display screen. Integrated into the hub is a wireless charging pouch which powers mobile phones and other portable devices without the need for messy wires and multiple chargers. The ‘magnetic induction’ technology passes an electric current through a coil embedded in the charging pouch, this in turn generates a magnetic field which creates a charge and powers the battery. 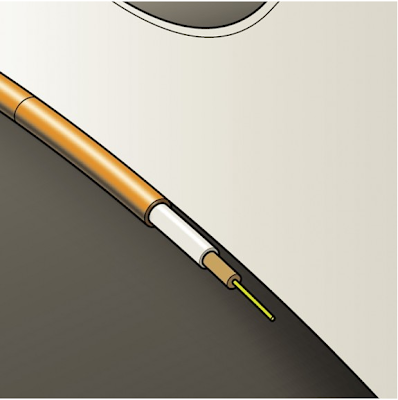 Also controlled by the central hub is an internal heating element embedded within the tent’s groundsheet; this under floor heating is triggered automatically once the interior temperature falls below a set level. Whilst currently only a concept, the vision of the Orange Solar Concept Tent has been designed to celebrate Orange’s 11th year at Glastonbury. This year, Orange Chill ‘n’ Charge tent will be at Glastonbury again, providing 600 mobile phone charging points, free internet access and live music. 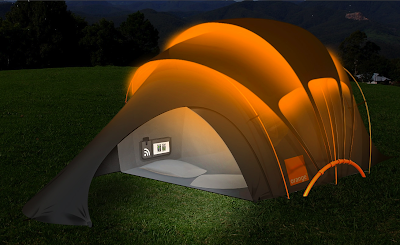 The Orange Chill ‘n’ Charge tent will be open from Friday to Sunday, 10am-10pm.